UPDATE- ROXIE HAS BEEN ADOPTED BY HER FOSTER FAMILY! We have been working with Help Every Pet of Hardin (HEP) for several years now. This small, volunteer based non-profit in Eastern Montana helps rescue neglected and homeless pets in communities on & surrounding the Crow Reservation. They also pull high risk animals from the Animal Control facility and transfer them to the safely of no-kill shelters like Stafford Animal Shelter. They do amazing life-saving work and we are proud to partner with them. We received a call from them last week with one of the most extreme cases of neglect and abuse that we’ve seen. 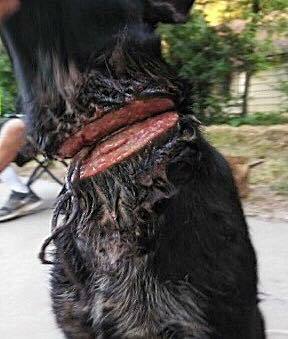 An 8 month old Black Labrador mix named Roxie not only had mange from neglect, she was found as a stray by concerned citizens in Lodge Grass with a rope, that had been tied so tight, it cut her neck and it became embedded as she grew. HEP went and rescued the dog and had her treated initially by their local veterinarian, Animal Care Center. In order to give her a fresh start they asked that we take her in and help find her the home that she deserves. 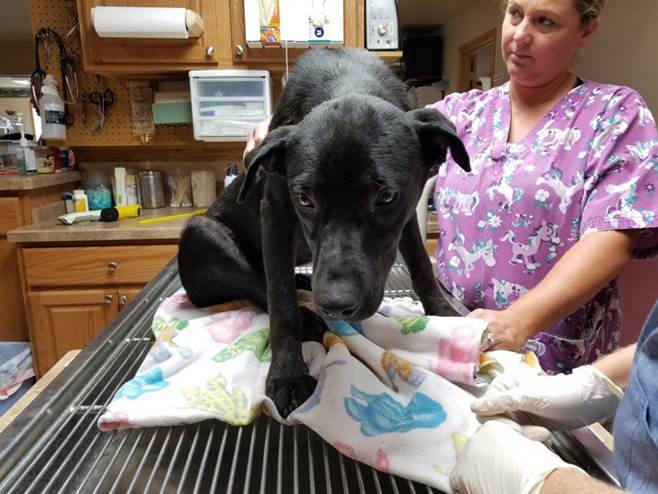 A volunteer transported the dog to Livingston where she was immediately seen by our Shelter Veterinary Partner, Dr. Trevor McCormick of Sleeping Giant Animal Clinic. 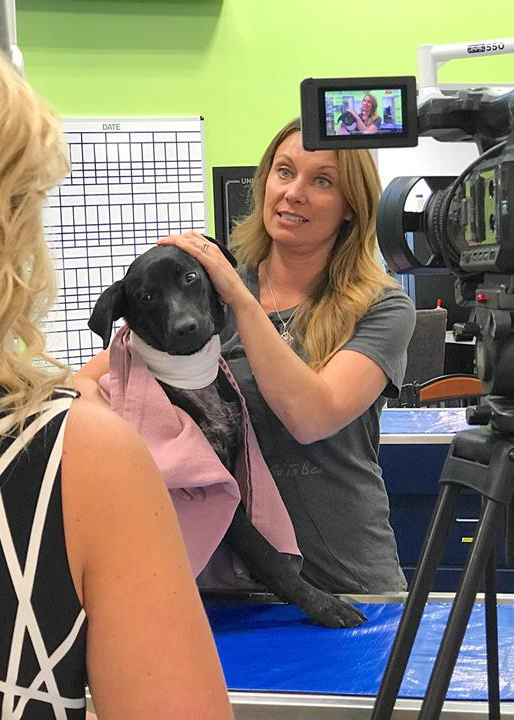 They addressed her wound, sutured her injured neck and are providing recovery in their clinic. Despite her ordeal, she is a happy and spirited young pup who now needs a home that will love and spoil her! Although she is recovering for a couple days, we are accepting applications immediately as we’d like her to go straight from the hospital into a forever home. organizations and Reservation Rescue Program. Dogs that have survived a trying ordeal, who have been left to fend as free roaming dogs or suffered unimaginable neglect at the hands of humans tend to be the most trustful and grateful dogs we adopt out. We know Roxie will be the same. We can only help these helpless animals with your donations. 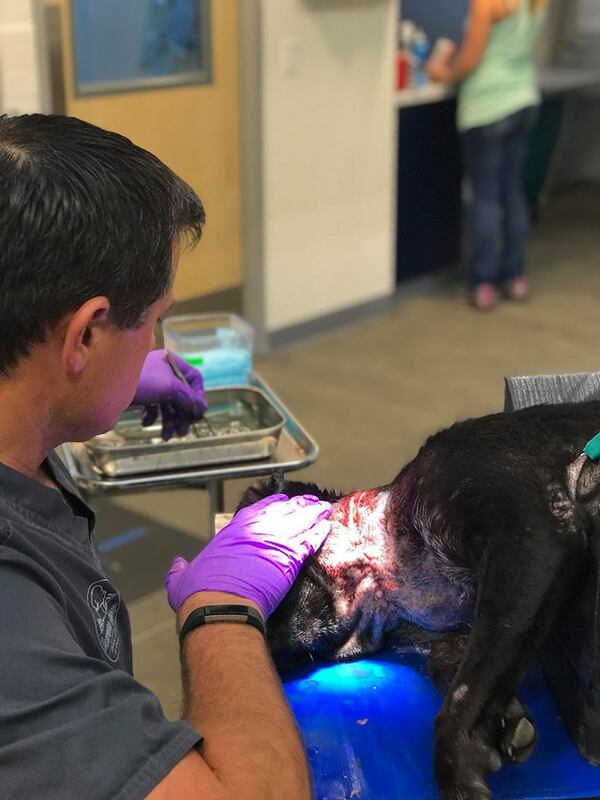 Our community should be so proud that for the last 3 years we’ve achieved national no-kill status and now treat animals with ringworm, parvo, distemper, neonatal kittens and severe injuries and illness. We accept any companion animal who needs shelter despite their age, health or species. We have no length of stay restrictions for our pets so they are welcome at Stafford as long as it takes for them to find a family. We believe they all deserve a chance and we thank you for supporting us in our mission. Stafford Animal Shelter is a 501C3 non-profit located in Livingston, Montana. The shelter receives no funding from governmental agencies and is not affiliated with a national animal welfare organization. All operating funds are received from donations.